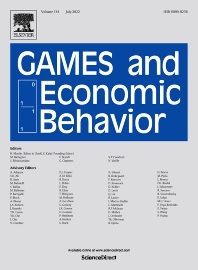 Games and Economic Behavior (GEB) is a general-interest journal devoted to the advancement of game theory and it applications. Game theory applications cover a wide range of subjects in social, behavioral, mathematical and biological sciences, and game theoretic methodologies draw on a large variety of tools from those sciences. Publication criteria: GEB publishes general-interest papers that significantly advance the frontiers of game theory and its applications. This is a high bar, but the journal's editors are open-minded about the interpretations and trade-offs involved. For example, a paper in industrial organization that deals with corporate takeover might be of general game-theoretic interest if it contributes to our understanding of coalition formation. Similarly, the analysis of games played by computer algorithms might be relevant to modeling strategic thinking. The editors are also open-minded about the frontiers. They are happy to publish papers that, while not in currently popular areas, lead to significant new frontiers in game theory and applications. Authors are therefore encouraged to make a clear case, in the paper itself, that it meets these publication criteria. Evaluation procedure: Each paper is initially assigned by GEB's chief editor to one of the seven editors (including himself), who has final decision authority. In determining their decisions, editors consult with advisory editors and reviewers who are anonymous to the authors. The assigned editor then (non-anonymously) communicates her/his decision to the corresponding author in a decision letter, usually accompanied by one or more referees' and/or advisory editors' reports. Currently GEB publishes about 15% of the submitted papers. However, when editors decide that a submitted paper does not have a chance of meeting the journal publication criterion, they "desk-reject" the paper without going through the standard, lengthy evaluation process. About one third of the submitted papers are desk-rejected.